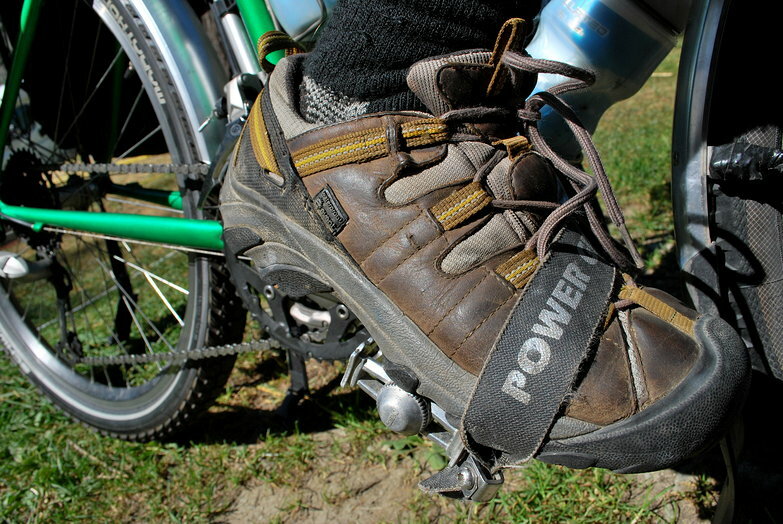 Power Grips are a very simple foot retention system originally designed for mountain biking in the 80s. They are nothing more than a pair of one inch wide straps that mount diagonally across your pedals. The straps themselves are made of a durable material that I can only describe as something of a mix between nylon, leather and skateboard grip tape. Simple was a big theme for us when I was building our bicycles and these definitely fit the bill. To enter the system you insert your foot into the strap at a slight angle (similar to the angle for exiting a clipless pedal system) and rotate it to a normal riding position, as you do this the straps get progressively tighter. You can also control the level of tension by how far you insert your feet into the straps. Like any retention system, entering and exiting takes a bit of getting used to but it doesn't take long before it becomes second nature. Early in our trip we encountered one issue with the Power Grips that bears mentioning. A corroded adjustment screw which came loose after Tara's crash pretty much rendered one of our straps useless. 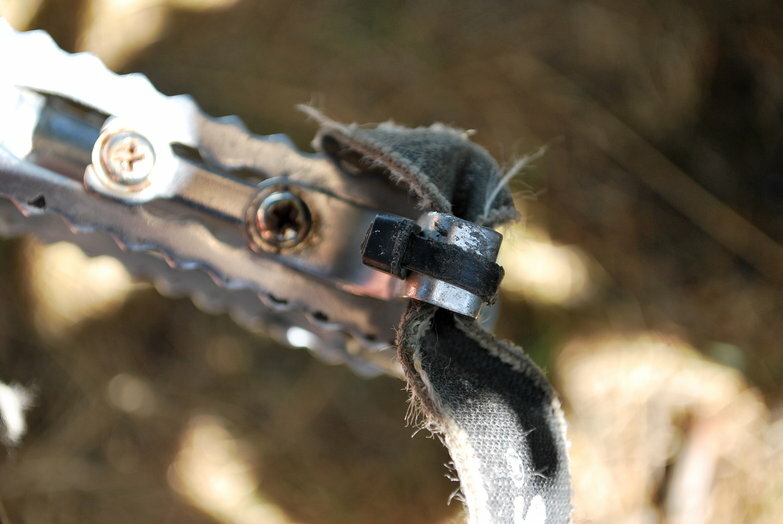 The mounting bracket for the straps is made of aluminum and the adjustment screw is steel. I strongly recommend using anti-seize on the threads. The entire adjustment system could use some revision in my opinion. Thankfully I was able to repair it with a cable tie! Since our repair, Power Grips have passed the truest test of quality gear: Tara and I have completely forgotten about them. They just work. Hi! 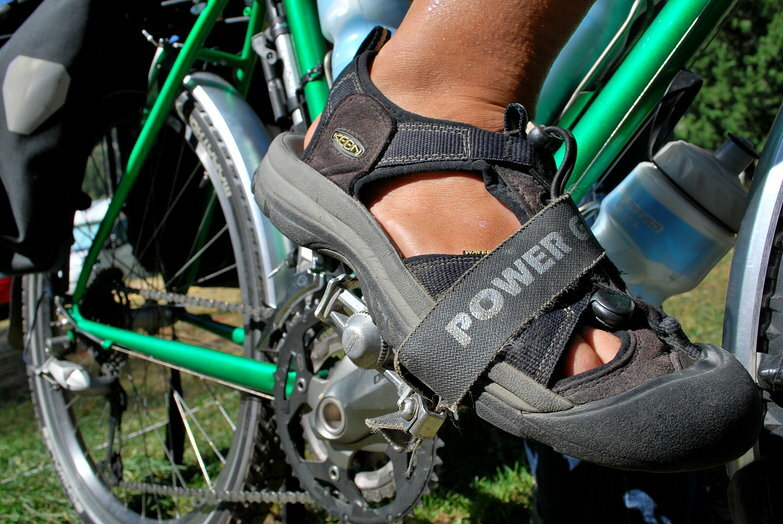 Any problems with your feet slipping out when riding in the rain (when the straps get wet)? I've found a couple mentions online of this being a potential issue with both Powergrips and Feetbelts. I am considering storebought or homemade versions for my own impending open ended global cycling expedition. We've ridden in LOTS of rain with no issues. As long as your pedals have some teeth you should be just fine. Good luck with your tour preparations!